WHAT?? Talk about throwing a bunch of big words together. 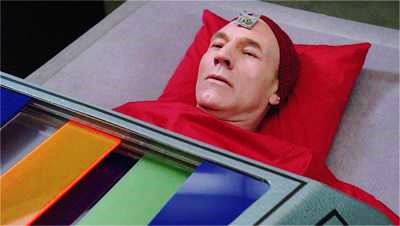 For all I know, it could have meant Picard had a killer case of hiccups. What we need here is some plain language that everyone can understand. And that is exactly what we need in the Project Outcomes section of the Final and Interim Research Performance Progress Reports (F-RPPR and I-RPPR). As you are aware, with NIH’s implementation of the F-RPPR and I-RPPR, a new section, Section I – Outcomes, has been added. The Outcomes section will be made publicly available through the NIH RePORTER website. The objective is to provide the public with easily understood results for NIH-funded biomedical research, thus improving the transparency about the use of federal funds. NIH will only publish project outcomes after they’ve been reviewed and approved by NIH staff. 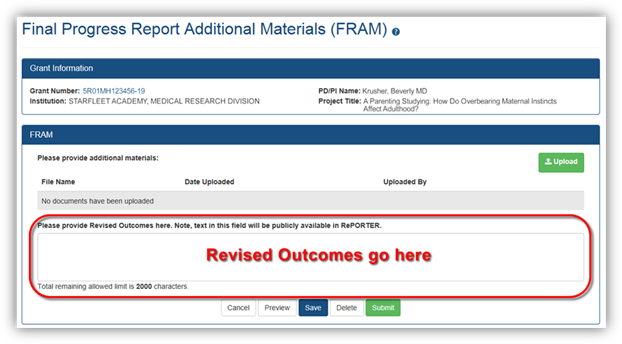 If a project outcome is in biomedical expert-speak, shares proprietary information, or includes Personally Identifiable Information (PII), a grantee will be asked by NIH staff to submit revised project outcomes using the Additional Material functionality for the Final and Interim RPPR (i.e., Final Report Additional Materials (FRAM) for Final RPPR, IRAM for Interim RPPR). Grantees will respond to these requests using an enhanced web form that supports NIH’s ability to make this information public. Submitting a revised outcomes statement is accomplished by using only the Project Outcomes section on the request for Additional Material web form. This text box is NOT for general comments or communication. And revised outcome statements will not be accepted if they are uploaded as an attachment. That functionality is reserved for other types of requested information. For the latest Guide Notice on Project Outcomes, please see NOT-OD-18-103. For an example of an acceptable Project Outcomes description, please see the Summary of R01HL066004. For more information on Interim and Final RPPR, please refer to NOT-OD-17-085 and NOT-OD-17-022. SURGEON: There's been some voltage drop here. Let's proceed carefully. We'll need to closely monitor the voltage / amperage balance. SURGEON: It's not working. Something's wrong. The alligator clips aren't holding. Damn it! I can't stop the power drop! SURGEON: We need an electrician in here. This man is dying.